Bellevue fashioned its new downtown bike lanes into an interesting and creative experiment in public-policy process. 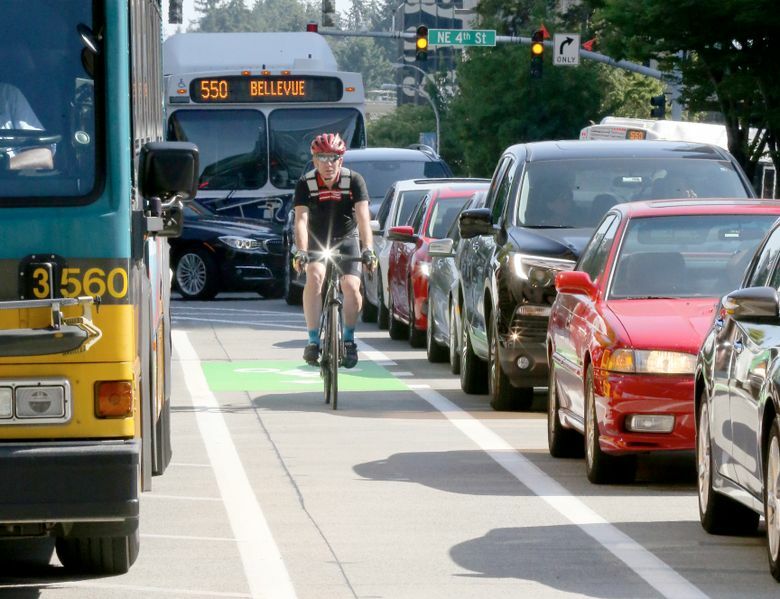 Bellevue took a smart, sensible approach when it built its new bike lane through downtown. The recently opened path on both sides of 108th Avenue Northeast is easy to traverse even for a bike rider with limited urban riding experience. Even more important, the city is making slow, careful steps toward welcoming more bikes to its streets. Bellevue set the new lane up as a pilot project — trying out a variety of lane architecture to separate bikes from vehicles, from a painted line to planting boxes. The city smartly asked for input from the downtown business community before designing the demonstration project. And it plans to spend at least a year assessing the downtown pilot before moving forward. What could have been a controversial project became an interesting and creative experiment in public-policy process because of Bellevue’s approach. On a recent weekday morning, motorists seemed aware and respectful of bikes sharing the road. The lanes, which stretch three-quarters of a mile, follow a major north-south arterial through downtown right past the Bellevue transit center. Casual riders could load their bikes on a bus heading downtown and find their way around. Bellevue also has just added electric-assisted rental bikes to its transportation ecosystem. Officials in this Eastside city like to try new things, ask for input and then adjust. The new bikeway is a great example. Bellevue will likely have at least one downtown bike lane after the pilot project, but the end result may be different from the initial design. This project could also help the city expand and improve other bike lanes weaving through its neighborhoods. The lane network should give cyclists a safe way to maneuver through the city, for work and play, without worsening traffic. A few problems are already apparent downtown. The bike lanes right next to parking spots are being swallowed up by lousy parkers in big vehicles, forcing bikes closer to moving traffic. A construction site’s safety perimeter has overtaken half a block of bike lane, forcing cyclists into the car lane. And on another block, bikes and cars share one lane. The lane continues north of downtown through a quiet neighborhood. Some residents have expressed safety concerns, wondering if cars, bikes and pedestrians will continue to politely share the space. That may become more of a problem when the lanes are more heavily used. On a recent weekday morning, fewer then 10 people rode by in an hour, including one cyclist who rode on the sidewalk instead of the new bike lane. Bellevue should be commended for showing how to engage the public in public policy.